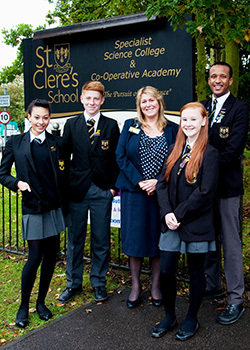 St Clere’s Secondary School was established in 1978 and converted to a single Academy Co-operative Trust in 2011. In 2012 the Trustees formed a Multi-Academy Trust, which now includes includes St Clere’s Secondary School, East Tilbury Primary School and Nursery, Thameside Primary School, Stanford-le-Hope Primary School, Arthur Bugler Primary School and Brentwood County High School. We have held science and sports specialisms since 2013. In 2018 St Clere's Co-operative Academy Trust rebranded as Osborne Co-operative Trust, following the death of St Clere's long-term supporter and Chair of Governors, Mr Ray Osborne. We have around 1,300 students here, who are busy finding out that learning can be enjoyable and something that will bring them greater opportunities in life. Our staff teach with great energy and intelligence in an environment that has exceptional facilities. We are set on the edge of Stanford-le-Hope, a short distance from the A13 and are surrounded by a large expanse of playing fields which enable our students to enjoy a vast array of sports. We have a stunning range of facilities including a state of the art Drama studio, an Apple-Mac suite, fully refurbished Science labs, Sports Pavilion, a 3G floodlit all-weather pitch, exceptionally well-stocked Library with research facilities and quiet study space. In addition, we have high specification classrooms with up-to-date ICT resources which enhance the teaching for all students and provide a comfortable environment in which to learn. We have a reputation for very high academic standards and outstanding student conduct. St Clere’s students consistently achieve results above national standards. We encourage all our students to strive for success. Our teachers promote and model creativity and individuality. Our website will give you an idea of the variety of experiences we offer our students and the vibrant atmosphere that is created here as learning and discovery takes place. Our prospectus is available to download here, or you can call 01375 641001 to receive a copy through the post.